"In my dream I was floating across America, but I had no fear. Bombs had landed everywhere, the land was totally destroyed. I saw people standing outside their homes weeping, holding on to each other. I saw dead bodies lying around. I heard someone say, "This should never have happened, this should never have happened." National destruction had hit America. There was no food or water. Everyone was crying. I saw grown men crying and holding their families, begging God for mercy. The trees were all knocked over. Limbs and leaves were all missing from the trees except a few of the main large trunk limbs. As I continued to move across America I saw people running, searching for missing loved ones many seemed to be totally out of their minds! I floated over a large city which looked like Columbus, Ohio. There were riots everywhere. Store windows were broken, everyone was looting the stores. They were not taking T.V. 's and I-pads they were taking food, water, and things to help them survive. I even saw one man shot to death by someone in the crowd. I saw Barak Obama point the shot-gun and shoot the eagle out of the air. It fell dead to the ground. Obama smiled and said, "I've done it, and I won't have to deal with this in my administration." I heard a voice say, "Tell the people this is My will. This is My hand, both upon the generation of the righteous and upon the cursed. The righteous will find their way and know what to do. The cursed will wander around with no compass. The cup is full!" From that point on I knew that we were coming to a showdown. It was going to be between good and evil. I saw some people gathering into homes that were not destroyed. I saw people having prayer meetings in which they were only praying in the Spirit. I saw others having a home bible study. I saw Bible prophecy DVD's, CD's and books from ministers on a table, they were using them as Spiritual food they had stored up to teach them in this time. I heard a Voice say, "Pick up the mantle of prayer. Cover yourself with it and find you a secret place to cover my servants in prayer. Many eyes have been anointed with a special anointing to see. Others are blinded to My Word. All things will be revealed in their due course. As I stood there hearing the voice of God, I saw a very old table in Washington D.C, it looked as if it had been used over many years to sign many important documents in the past. I saw a voting ballot laying on this table with two names on it. It had “Barak Obama" and “Mitt Romney." I saw a checkmark beside Obama's name. 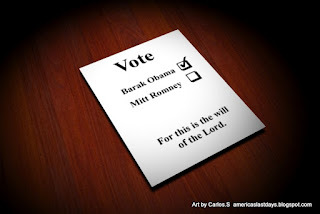 These words were written at the bottom of the ballot, “For this is the will of the Lord."